A large talus field at Black Rock. 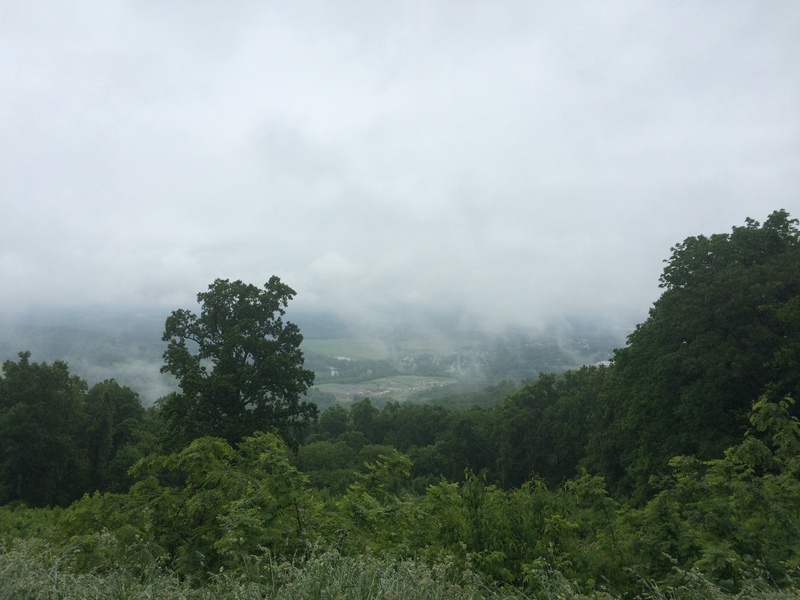 Shenandoah National Park, VA, May 18 – 21, 2015 — There isn’t a boy in this country whose dad, at some point, tells him that if he doesn’t study hard in school he might end up digging ditches or bustin’ rocks on a chain gang. Well, in spite of everything, I ended up doing both. What a way to retire. 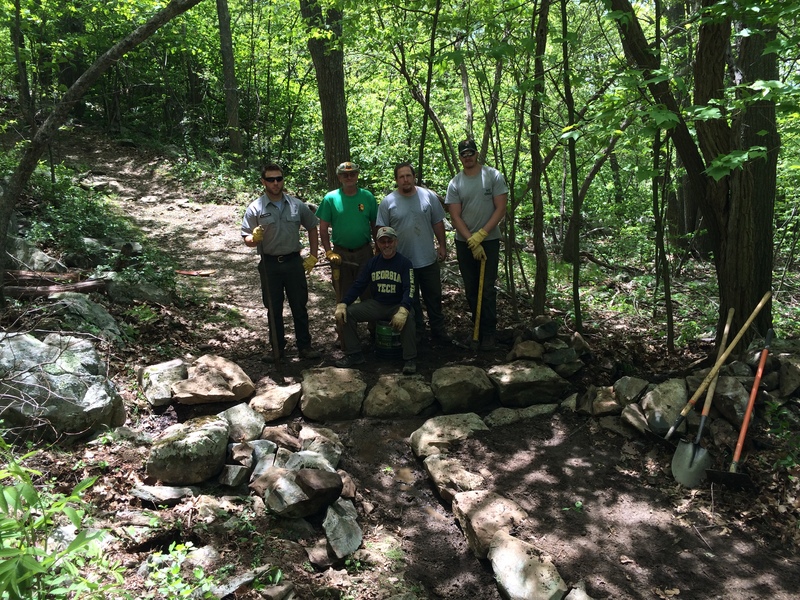 Crew week is when trail club volunteers work side-by-side with park rangers, or alone to tackle priority projects generally too time consuming or to costly for the park crews by themselves. These days, the National Park Service is woefully underfunded. That funding can’t be made up by raising entry fees, so the maintenance backlog builds and sometimes volunteers can step up to help. That’s us. The 105-mile-long Shenandoah National Park is divided by thirds into three districts – north, central and south. We were a north district crew, living in the central district, starting work in the southern district. Huh? 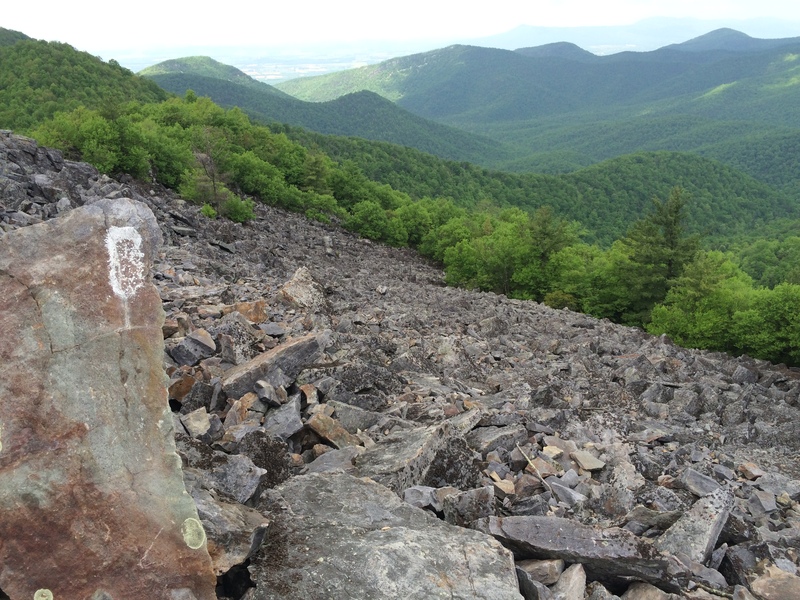 The Appalachian Trail (AT) at Black Rock is severely eroded. No mater what kind of treadway is built, it eventually seeps deep in between the talus blocks and disappears forever within the cold dark oblivion. 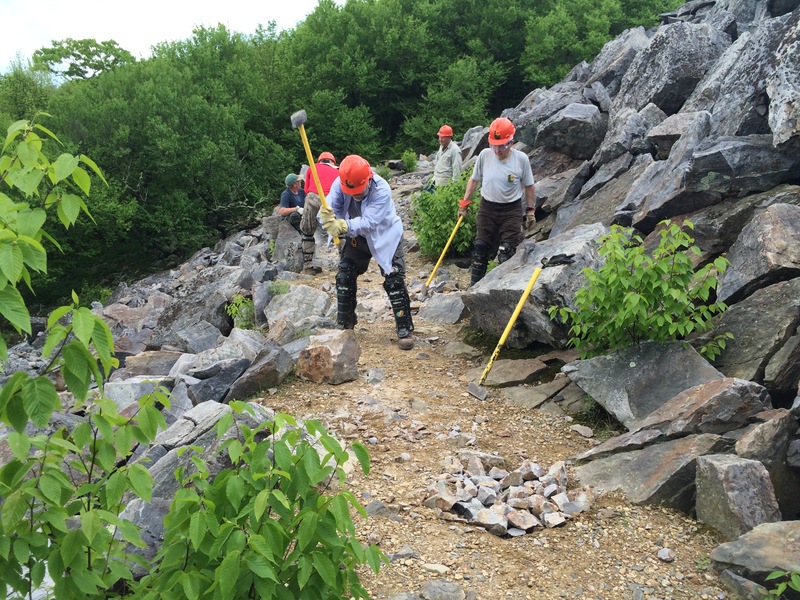 This summer the Black Rock section of the AT is being rebuilt. 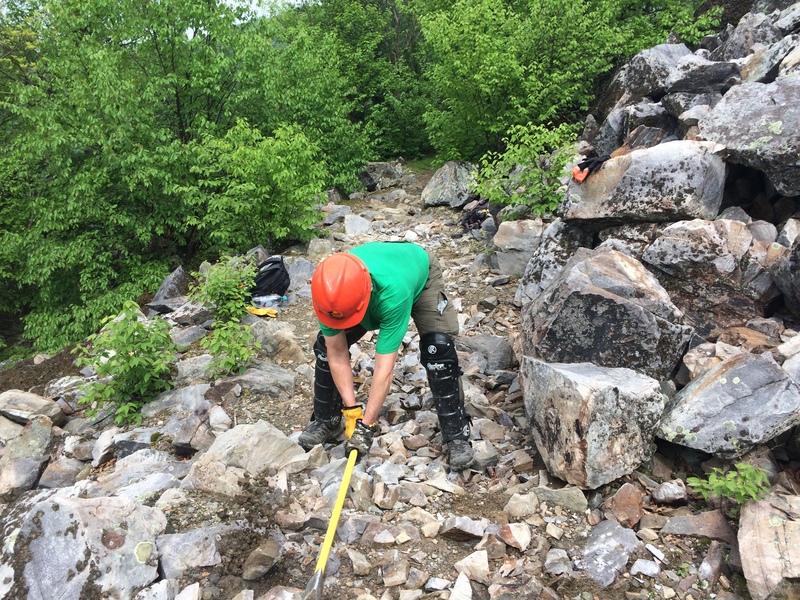 Our mission: Shatter basketball size rocks into golf ball size shards over which pea gravel will be poured thereby recreating a smooth trail. Swinging like Big Papi – not! The day started with a 50-mile van ride south to mile marker 84 where we parked. A short hike to the work site followed. Another crew had worked at the site earlier, mashing up about 25 yards worth of the approximately one-third of a mile needing work. That made us wonder how much we – six sixty-something guys – were going to get done. The thunderstorm in the forecast kept scratching the back of our heads as we contemplated the day ahead. 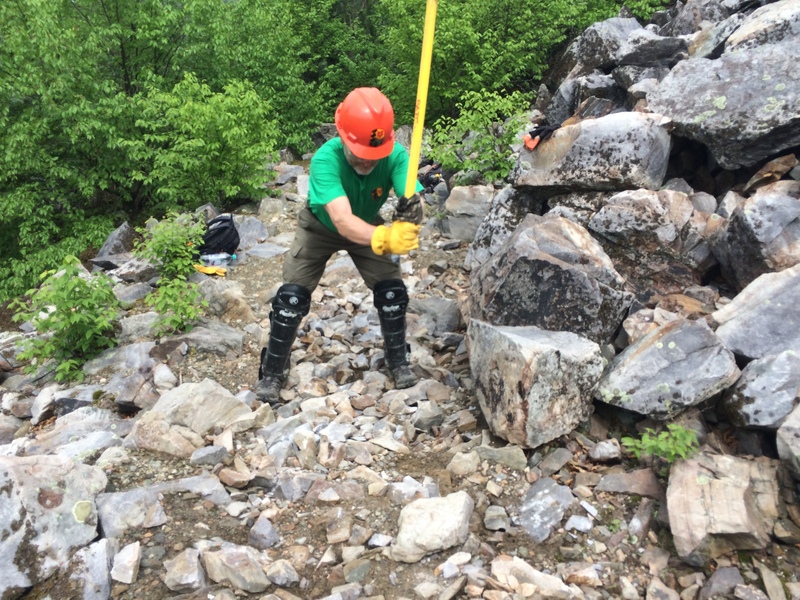 Ever smacked a rock with an eight pound rock maul? Let’s just say it’s at the same time both easier and harder than you think. Hit the rock square and the hammer does most of the work and you look like Thor flashing rock shards like lightning bolts. Hit it wrong and and the hammer head bounces back and/or the sting reverberates through your hands, to your shoulders and down to your toes. Ouch! I’d rather stick a finger in a light socket. Eventually you wilt like a flower. After about six hours of wailing, sweating and grunting, we got ‘er done! All of it!!! The karma was strong. The first rain drop smacked the windshield just as we turned northward on Skyline Drive. Nice. Our daily routine is to make breakfast at the Pinnacles research building where we stay, take our lunch and eat out in the evening. We ususally go to the nearby town of Luray (pronounced Loo-ray). 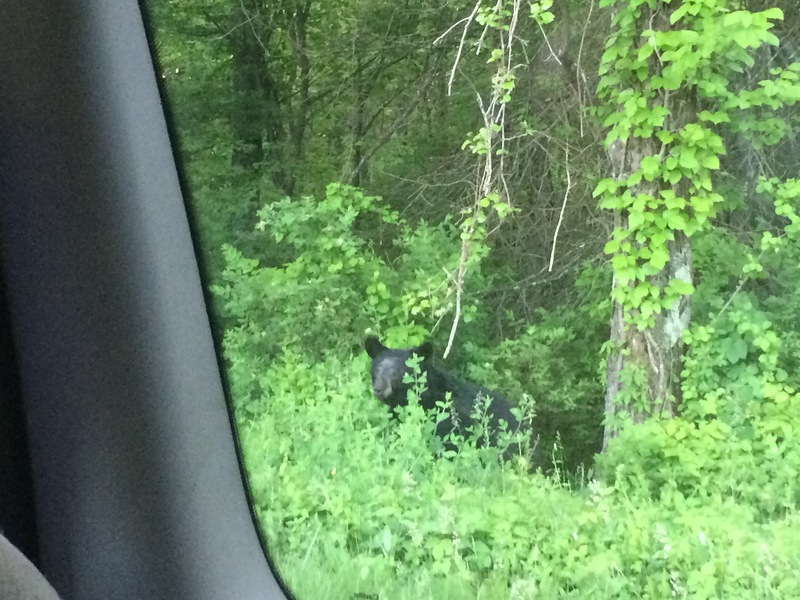 This bear greeted us just past the Thornton Gap entrance station as we returned from dinner. Can’t think of a better way to end a day. 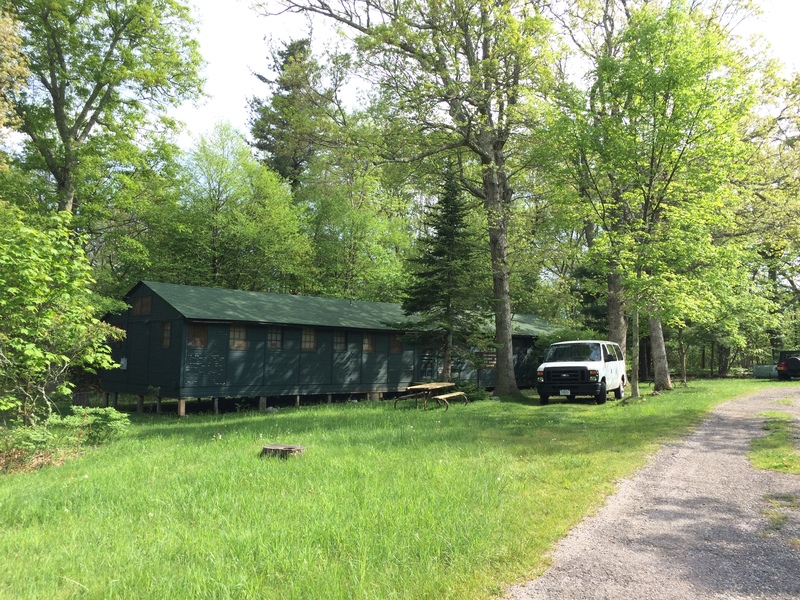 An old CCC building, called the Pinnacles Research Station, where we stay. 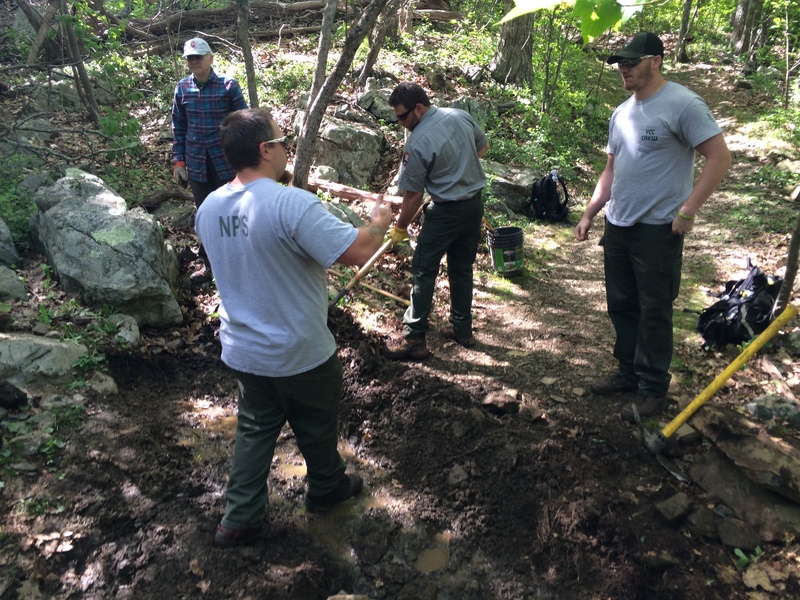 The next couple of days found us working with the rangers to rehab the Overall Run trail. This trail connects to the Tuscarora trail which eventually rereconnects with the AT in Pennsylvania. We broke into two groups and attacked. 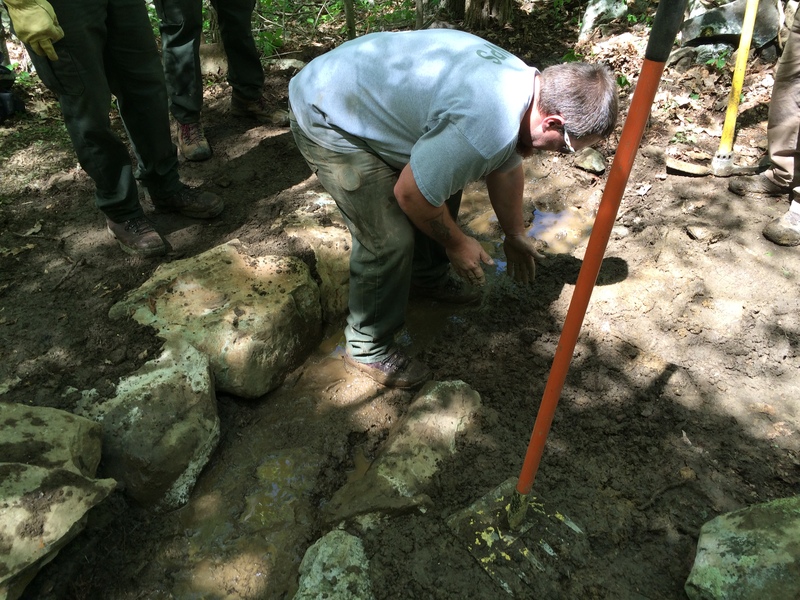 If it needed repair, replacement or a new erosion control structure was needed, we had the muscle to fix it. China must be down there somewhere! 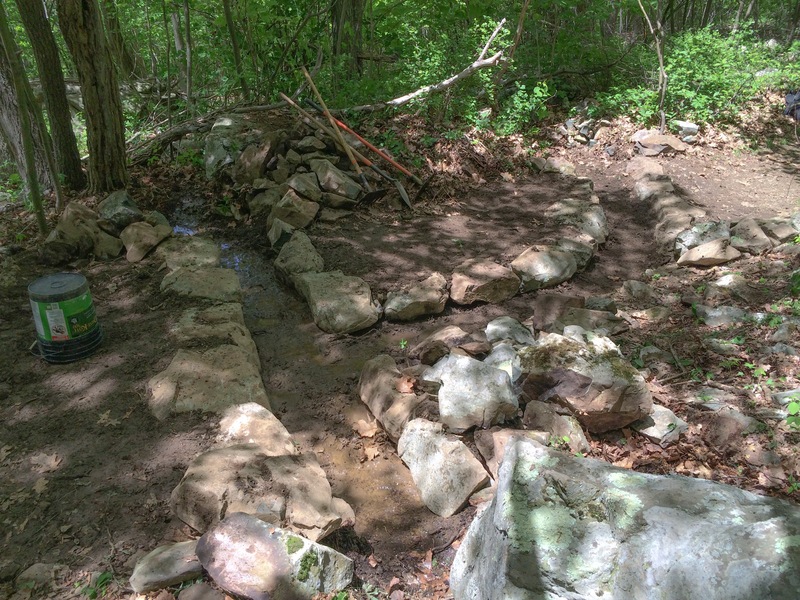 A spring had been turning this chunk of trail into a gross mud hole which would eventually drive hikers to expand the trail, leading to erosion. 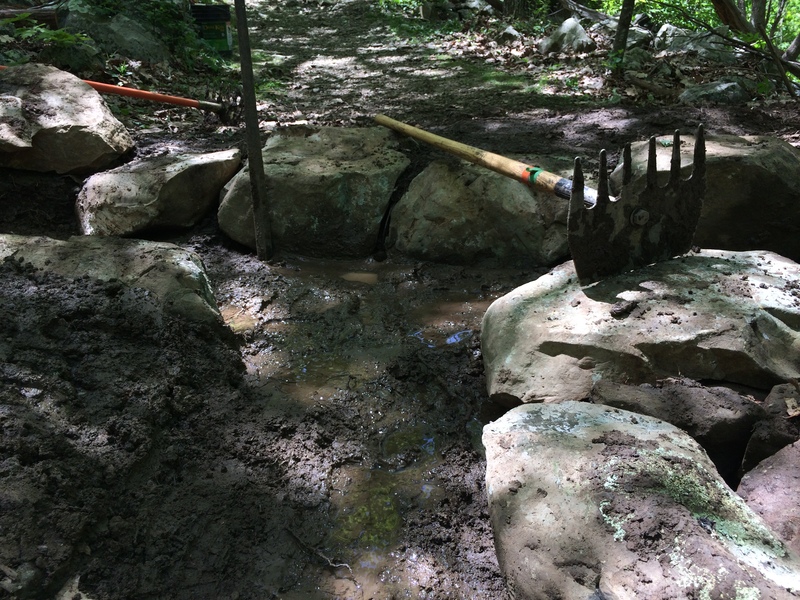 We decided to dig and line a culvert, add a lateral drain and a divert any serious flow off the trail with a waterbar. We’d build up the trail in between, thus creating a turnpike. Photo taken from atop the source of the spring. Wearing my Georgia Tech shirt in honor of our engineering feat. We eventually got rained out on Thursday and called it a week. Mission accomplished. Thanks in advance. I hope to attempt the AT in the summer of 2017 or 2018, knees and arteries willing. We should talk before you start, if you think I can help. I’ve wanted to do the AT since college. Life, work, kids and the mortgage got priority. Now age and health are a BIG issue but I never say never. I write novels now that I’m retired. Mostly crime/thriller (3 so far) but I also wrote a historical novel set in the 1750’s sending my characters over the Pennsylvania mountains dodging wolves, panthers and not so friendly Indians. The AT is about as real as it gets to inspire future fiction. At least the wolves and panthers are gone, just have to watch out for deer ticks and the mice. The deer tick is the most dangerous animal on the AT by far. I hiked alone through the winter. I’ve been within 10 ft. of a bear more than once. In spite of all that, nothing frightens more than a tick. Working on the chain gang…almost. What did you do to deserve that? That iss painful just viewing the pictures. My lower back would never forgive me if I tried that. Looks like the fix for the spring was well done. There were some serious muscles on some of those guys. Thanks for the interesting update. You are keeping in shape. I know I’m a glutten for punishment but that’s what I woudl like to do when I retire! Can’t think of a better way to spend my days!! Thinking about doing a trail crew next year. I know the trail thanks you for your efforts!! You should join PATC and volunteer with us! Do I just go online and join?? I LOVE playing with tools and I run with a chain saw!!!!! http://Www.patc.net. 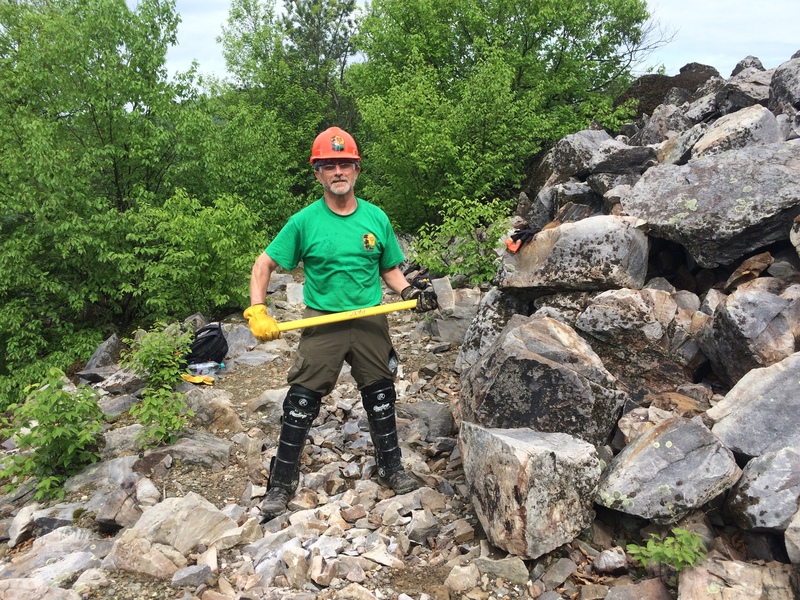 You have to have a National Park/Forest Service certification to use a chainsaw. Catching up on your blog. This entry brought back memories of breaking up sandstone with my little brother and sisters. We would pretend we were making gunpowder…the one with the most was winning. What we were winning I have no idea! I can recall, vividly, that feeling that shot up my arms from hitting the sandstone with my dad’s sledgehammer. Felt like my bell had been rung! 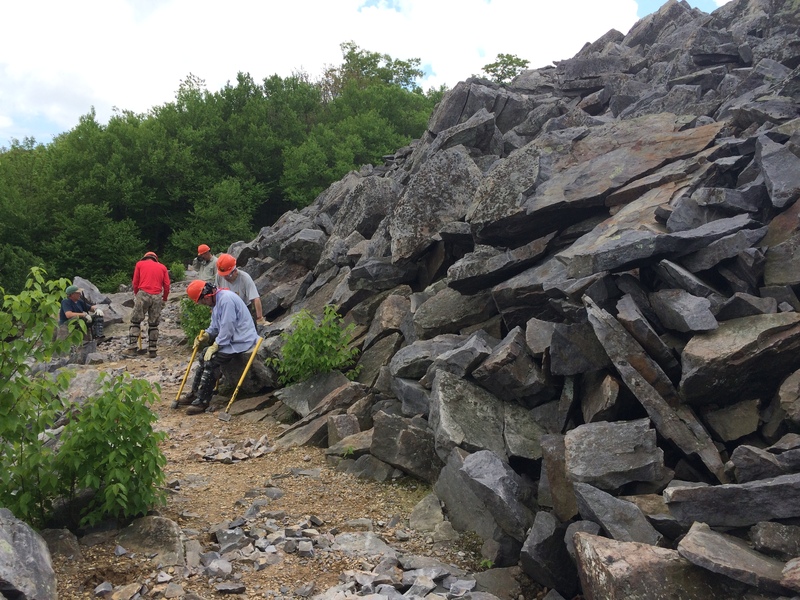 Actually if you hit the rock square, it usually breaks — and that was basalt. It is interesting to find out more about the AT. I have a niece who is a thru.hiker. I think she has hiked 500 miles so far. 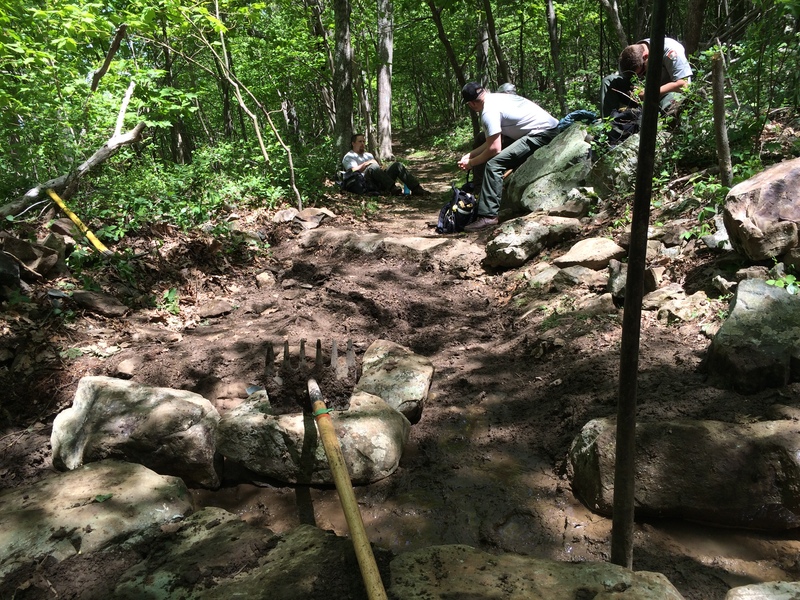 I’m surprised at how many Trail Angels there are out there to help the hikers out. God bless all of you. Thank you and good luck to your niece. There are many very nice people who make hiker’s lives easier. 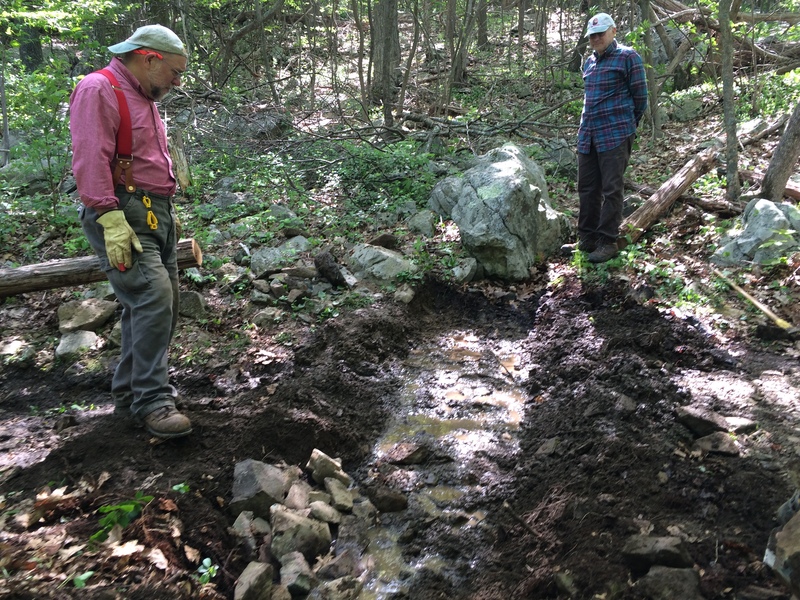 It’s also remarkable that the AT was largely built by volunteers (and the CCC in the two national parks through which it runs) and as been maintained by volunteers for the 90 years of its existence.